Listen – both you and I know that children’s books are two-a-penny these days, but there’s a book being released today which I really think you ought to buy for the young children in your life. One thing I’m passionate about (OK, so I’m passionate about many, many things – but that’s not the point) is the use of children’s story books to teach kids about life. 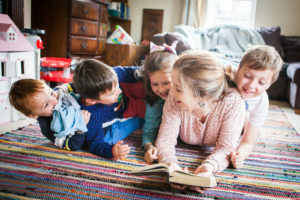 Of course reading can be for pleasure in and of itself – but, especially for young children, stories can also help them to find their place in the world, accept people and situations around them, and learn to appreciate difference. Stories give them a framework for life, and can influence their opinions positively or negatively. For example, children can observe what a loving, forgiving sibling relationship looks like by reading Charlie and Lola; they can learn generosity through A Squash and a Squeeze or The Smartest Giant in Town; they can develop an understanding of adoption in Zoo Girl. I’ve been working on a book which helps to teach an important concept to young children, and I can’t wait to share it with you, hopefully fairly soon now! 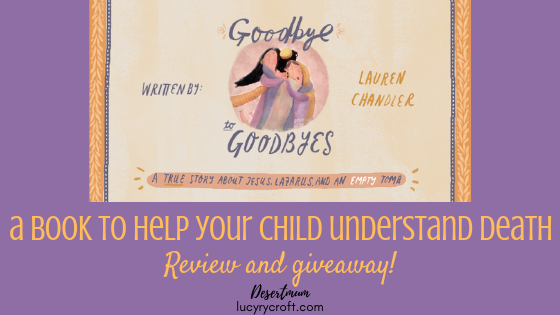 But today it’s my absolute pleasure to introduce you to Goodbye to Goodbyes, a book which covers one of the most important taboo subjects: death. How do you begin to explain death to a young child? I’d hazard a guess that we tend to put off the conversation until someone we’re close to is about to die – or, worse, after someone close to us has died unexpectedly. Perhaps we find ourselves wishing that we’d had that conversation a little sooner. 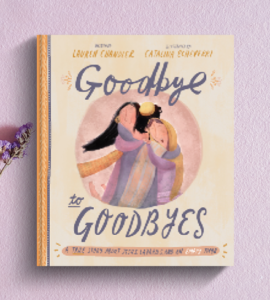 The account of Lazarus in John 11 is such a key passage to helping children and adults alike to understand death from God’s perspective, and it’s this story that author Lauren Chandler has chosen to re-tell in Goodbye to Goodbyes. Her own husband was diagnosed with cancer, and she wrote this book to help explain what was going on to their three children. I love the language she uses to help young children absorb and understand this story, which is linked seamlessly to Jesus’ own death and resurrection, and then to our own experiences of saying goodbye – sometimes for a short time, sometimes for a long time. The book is hope-filled and honest, not shying away from the hard fact of death, but with an overriding theme of ‘Jesus came to end goodbyes forever’. So it’s not morbid or bleak: the book is positive and uplifting. My kids and I really appreciated this one. Monkey and Meerkat (4) enjoyed the story, although got a little restless in the final few ‘application’ pages – but that’s OK, they still got the Lazarus bit, and they’ll absorb the rest when they’re ready. Missy (7) enjoyed it and was attentive throughout. I didn’t show it to Mister – at nine years old, I felt he was probably slightly beyond the intended age range. But, as I started writing this review, he came downstairs unable to sleep, so I gave him the book to read as distraction (and to allow me to write a few more words!) – and he enjoyed it too! Catalina Echeverri’s illustrations are superb. If you have books like The Garden, The Curtain and The Cross, or The Christmas Promise, then you’ll be no stranger to her beautiful designs, full of life and expression, drawing the reader into the story. You know what’s coming next: a chance to win this gorgeous book! I’ll be sending a free copy to one lucky reader. To enter, simply sign up to my email list here (it’s free, and I’ll even send you my ebook 15 Spiritual Practices Every Tired Parent Needs To Know as a thank you!). This giveaway is now closed. Congratulations to Sarah who won! I’m already on your list! But fingers crossed for a copy of this. We keep multiple copies of Bob Hartman’s _Tapestry_ to give away to bereaved children, but sadly it’s out of print now and hard to get hold of – perhaps this can be the replacement. A timely book as we are preparing our 6 and 7 year old (and ourselves) to say goodbye to Nanna recently diagnosed with pancreatic cancer that has spread. Thanks for the review. Looks fab – would love a copy for my children. My 3 year old has been asking a lot about death lately looking at pictures of people and cats no longer with us so thanks for this! This looks great! -my brother died suddenly aged 38 two years ago, and for some of my younger children, the conversations about death are only just starting to open up. I’ve found books such a helpful way to start dialogue on difficult topics, and, like you say, it’s hard to find ones on death. Thanks for the review. Looks really helpful – would love this. Sounds great! I love the other books by the same illustrator. Thanks for reviewing this one; I hadn’t heard about it! Hope to get a copy either way! Thanks Michelle! I’m afraid the giveaway is now closed, but do order a copy…I’ve linked to the sales page from my review so it should be easy to find!